Young children are especially prone to Eustachian tube blockage due to the immature anatomical structure of the tubes that are much shorter than adults’ and more horizontal making it easier for nasal drainage fluids to enter the middle ear and cause ear infections. In rare cases, adults with especially narrow Eustachian tubes might also be predisposed to clogged Eustachian tube incidents and chronic ear infections. 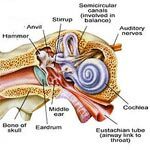 So let’s try to figure out why ears get clogged and what causes Eustachian tube blockage. A case of blocked Eustachian tube is mostly caused by inflamed nasal tissues when a person comes down with plain old cold and subsequently causes narrowing of the Eustachian tubes, liquid accumulation in the middle ear that creates a sense of fullness, pain and irritation of the middle ear. Allergens, environmental toxins, and smoking can also contribute to your Eustachian tube blockage creating chronic inflammation of the nasal and ear passages. Eustachian tube blockage is most often remedied by a combination of nasal decongestants, anti-inflammatory medications and antihistamines to fight inflammation associated with allergens and pollutants. Additionally, ear infection treatment with antibiotics might be necessary if your Eustachian tube blockage is accompanied by fever, high levels of pain and middle ear fluid secretions. In some extreme cases of recurring ear infections, myringotomy (ear tubes) is performed by placing a small incision on the eardrum to release collected middle ear fluid and relieve ear pressure.